Today we will be featuring calendar date pickers to let you output planners, calendars even more easier, most of these date pickers are built on jQuery and jQuery UI (User Interface). I would consider these date pickers as frameworks with great functionality, but most of them require modifying and some styling, but I think it’s really acceptable since each project needs it’s own design and you should change style of calendar plugin too. These plugins will help you and your visitors keep track what’s happening in specific project and help to organize time! This is tutorial how to make kind a like iPhone calendar application. The DatePicker lets users easily select valid dates from a dropdown calendar. No need to worry about date formats, by picking dates it’s always correct. Calendar Component that is very customizable and extendable. This flexible, simple pop-up calendar is written to work across browsers. It’s fully commented and customisable for language, colours and date format. The pop-up displays a month at a time from a specified range of years. This is ideal for combination with server-side technologies to produce a professional application. Calendar System – the basic calendar. One installation of plans can support many calendars. Calendars can share information with each other. Each calendar is managed independently (unique password, custom options, custom look & feel). Multiple calendars running on the same installation of plans can be “embedded” in completely different websites. Plans uses a powerful and flexible recurring event model. Plans supports multiple languages. Weeks can start on days other than Sunday. Plans supports arbitrary date formats (mm/dd/yy, dd/mm/yy, etc.) Plans can store data in flat files or an SQL database. This element enables you to pick dates with a simple slider bar. By dragging the bar over the time-line, the dates change instantly. Besides this, when the user decides to manually change the dates, the bar is automatically adjusted to the corresponding dates. FullCalendar is a jQuery plugin that provides a full-sized, drag & drop calendar like the one below. It uses AJAX to fetch events on-the-fly for each month and is easily configured to use your own feed format (an extension is provided for Google Calendar). It is visually customizable and exposes hooks for user-triggered events (like clicking or dragging an event). Timeframe is open source, tested, and available for forking, pushing, and pulling at Github. It can select dates “from – to”. Date / Time Picker is a easy date picker control. To open the calendar, click the icon at the right side of the input box. This is another example of easy date picker. Calendar has three required dependencies: the YAHOO Global object, the Event Utility, and the DOM Collection. 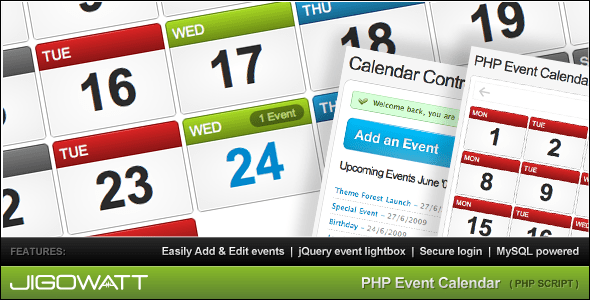 PHP Event Calendar is a MySQL Database driven script that displays events on your website quickly and easily through a traditional calendar UI. It can be integrated into any existing PHP page within minutes using a simple file include. It features a simple yet advanced Administration Panel with secure login sessions, from within this you have full control over your calendar events and gives the ability to Add Events, Search & Edit Events, Delete Events from your calendar and so forth. This plugin wraps the jQuery UI datepicker into an interactive component specifically designed for choosing date ranges. It is an update from a former version. VCalendar (Virtual Web Calendar) is an open source Web calendar application for posting and maintaining events and schedules online, in calendar format. This is an excellent and free solution for use by online Web communities and any commercial and non-commercial organizations. Unlike any other online calendars, VCalendar comes with source code in multiple programming languages: PHP, ASP and ASP.NET (C#); with potential for adding more technologies in the future. All day and month names are automatically generated specific to your locale. Allows you to choose what day your weeks start on. Multiday Calendar Datepicker JQuery Plugin is a nicely animated calendar datepicker for multi-day selection with multi-month display. Allows for a sequence of months to reside side by side and for the user to select a number of consecutive days. This is great for lodging reservation systems, ticket purchasing systems, etc. Date Input is a no frills date picker plugin for jQuery. It is lightweight, fast and pretty by default. jQuery DatePicker is an clean, unobtrusive plugin for jQuery which allows you to easily add date inputing functionality to your web forms and pages. Designed from the ground up to be flexible and extensible, the date picker can be used in unlimited ways to allow you to add calendar widgets to your pages. This jQuery plugin makes it easy to add date and time selection to textfield inputs. This supports date and time, and renders the value to a single field in a configurable format. The jquery-week-calendar plugin provides a simple and flexible way of including a weekly calendar in your application. It is built on top of jquery and jquery ui and is inspired by other online weekly calendars such as google calendar. Flickr is home to over five billion of the world’s photos. Get a glimpse of another world by diving into the official White House photostream or the newest images from NASA. Or explore a moment in history with archived collections from the Smithsonian, Library of Congress and more in The Commons. See the world through someone else’s eyes, right here on Flickr. I published this collection back in 2007, albeit with a few minor updates here and there. Today I shared a new post showing the design blogs on my subscription list. That’s a more up-to-date selection. It’s not easy finding talented graphic designers, but it’s fair to say the best have a healthy online presence. So to make things easier, here are my top 50 graphic design blogs. I’ve categorised them byGoogle PageRank (PR) — Google’s way of determining the authority of a website, but don’t read toomuch into the PR, as all contain useful articles, with some blogs having an authority all on their own. Quipsologies – Corralling the most relevant and creative on- and off-line bits that pertain to the design community. Subtraction 7.0 – NYTimes.com’s Design Director, Khoi Vinh, blogs about design and other relevant info. Be A Design Group – a blog for graphic designers, created in March of 2004 by Adrian Hanft and Bennett Holzworth. Chris Glass, The Last 10 Days. A creative fella’s journal from Ohio. Grain Edit – covers contemporary graphic design / illustration, as well as design from the from the golden era of advertising (1950s–1970s). Graphic Define Magazine – focuses on the business of running a graphic, interactive, or web design studio. Spoon Graphics – the personal project of Chris Spooner, a UK based Graphic / Web Designer. NOTCOT.ORG – for your ideas + aesthetics + amusement. Because of its undisputed, logically intimate connection with web design, it comes as no surprise that graphic design is one of the most prominent and thriving methods of artistic expression on the internet. However, the graphic arts encompass far more than just the slick digital designs familiar to mainstream audiences. With a history stretching as far back as the art itself, graphic design involves not only the familiar fonts, clip art, and advertising, but illustration, character designs, layouts, packaging, and numerous other elements as well. The most visible, intelligent, and creative graphic design blogs available represent a small survey of what this versatile visual art has to offer. : For a glimpse into the far-reaching influence of design as a whole, Toxel offers an eclectic selection of articles and styles pertaining not only to digital art, but fashion, landscaping, cosmetology, sculpture, and a myriad of other functional, creative, and aesthetic works. In spite of this colorful and inspirational mix, the focus lay more on design as it interacts with technology than anything else. 2. Just Creative Design : Run by Australian wunderkind Jacob Cass, this blog serves as more than just an impressive personal portfolio featuring extremely clean designs. His passion for the medium shines through in his articles and observations on the industry, proffering expert advice on everything from fonts to finding inspiration. 3. Logo Designer Blog : Another Cass venture, this time focusing exclusively on logotypes and their designs. With an eye for branding, articles dissect what sorts of motivations and attitudes go behind creating a logo and how it relates to advertising and marketing. 4. Veerle’s blog :This blog is a little light on the portfolio, but heavy on Photoshop, Illustrator, and XHTML/CSS articles and tutorials. What art the author does post, however, provides an interesting peek into the creative process. One of the more interesting features is a widget updated with available graphic and web design jobs from around the world. 5. Bittbox:For professionals and amateurs alike, Bittbox generously provides invaluable freebies and tutorials. Free brushes, free textures, free icons, free vectors, free fonts – anything a graphic designer may need to give his or her projects a boost can be found here. 6. You The Designer:More tutorials and freebies – including some indispensable Photoshop brushes – are available here. One of the more attractive elements of this site, however, involves its networking opportunities. You the Designer hosts a forum and a search engine filled to bursting with graphic design and related jobs. 7. Design You Trust:Updated daily, this online magazine discusses design in all its forms, from the digital to the traditional and everywhere in between. Blog entries focus mainly on trends and issues in the graphic design and artistic communities. 8. Psdtuts+:Excellent tutorials and a wiki on how to get the most out of Photoshop stand as this blog’s main draw, but the free textures and icons also offer a valuable service for graphic designers as well. 9. Swiss Legacy:Typography, web design, and trends collide in one clean, cutting-edge package. Shows and studios from around the world also receive frequent mentions, tracing trends and innovations right as they unfold. 10. Ads of the World:One of the most intriguing aspects of art involves how it both shapes and reflects the society that spawned it. This blog, showcasing advertisements from every nation the contributors can find, acts as both a study in art history and a sociological treatise on what different societies deem appropriate, aesthetic, and effective. 11. Logo Design Love:Anything any graphic designer ever needed or wanted to know about logotypes can be found right here. Featuring tutorials as well as analysis of iconic logos and a smattering of news, this blog stands as one of the quintessential resources on a very common graphic design element. 12. Logo of the Day:A new logo gets posted each day for other professionals to rate and offer insight and critique. Though the majority of content stems from the level of activity on each logo, this blog provides a great insight into how graphic designers interact with and advise one another. 13. Designers Who Blog:Marketers, graphic designers, writers, and photographers converge to discuss how their respective careers overlap and intersect with one another. The focus here is on communication and the exchange of ideas and opinions regarding how to further the industry. 14. Stuff and Nonsense:Andy Clarke, who runs a graphic design firm in North Wales, traces the progress of current graphic and web design projects. In the past, this studio has worked with such prominent clients as Disney Store UK, Liverpool University, Save the Children UK, and WWF UK. 15. Creativebits :The blog may focus on interviews, news, and ruminations on graphic design and its rich history, but the critique portion of the site offers some of the most provocative and informative perspectives on the creative process. 16. design muse:An excellent site commenting on recent design and packaging trends as well as news and events on related events both virtual and physical. Everything is relayed in clear, precise language that even those outside the industry can fully grasp. 17. Lunch Bag Art:Every day, an artist father draws figures from pop culture and literature on lunch bags for his children. It is a simple, sweet idea that also underscores how graphic design and illustration exists beyond the boundaries of a hard drive. 18. David Airey:More than just a blog, Airey also showcases his portfolio, crammed with gorgeous ads and branding for clients around the globe. He highlights his creative process through photos and sketches of project progress and also offers advice on books and other resources for contemporary and aspiring professionals. 19. Evolution of Intelligent Design : This well-written, intelligent, and informed blog that ruminates on graphic design’s role in shaping and influencing society and business, offering yet another intriguing perspective on how art never blossoms in a vacuum. 20. Graphic Design Blog & Web Design Blog :Beginning as a collaborative project between participants in a graphic design forum, this blog has expanded into a broad but highly informative resource on Flash, photography, typography, illustration, CSS, HTML, and the visual arts and how they all tie into design as a whole. 21. Noisy Decent Graphics :Simple and unpretentious, this blog delivers both a peek into one designer’s creative trains of thought as well as his observations on the industry. 22. RightBrainTerrain.com:Updated daily, RightBrainTerrain.com offers highly refreshing and inspiring motivation for graphic designers and other artists to nurture creativity in any and every possible capacity. 23. Posterwire.com: Posters have remained one of the most visible and obvious applications of graphic design, and this blog looks at those featuring movies past and present, foreign and domestic, and how they come together to tell and sell a story. 24. graphito:The art and thoughts of graphic designer and art director Daniel Bretzmann flow together on this blog, which blends his portfolio with useful and interesting blips on relevant articles across the internet. 25. Elliott Jay Stocks:Creative Renaissance man Stocks has provided graphic design work for numerous bands – including The Beatles, Pet Shop Boys, Sigur Rós, The Chemical Brothers, and Massive Attacks – and publications throughout his enviable career. He chats excitedly in his blog about art, technology, and writing, drawing from his extensive professional experience to offer valuable insight. 26. Jason Santa Maria:Both blog and portfolio, this site discusses many of Santa Maria’s redesign and identity projects as well as his thoughts on the graphic design industry. The “Oddities” and “Daily Photo” sections comprise the most interesting content. 27. live from bklyn: Packaging and graphic design events characterize this blog by Brooklyn-based designer Dailey Crafton. The design shop especially features some visually striking pieces. 28. Graphicology: Two graphic design teachers generate the content for Graphicology, which delves deeply into stories, issues, and trends pertaining to the industry. Typography, logos, illustration, and other projects all receive highly in-depth and informative analysis. 29. We Made This:An award-winning graphic design and photography studio in London offers up its portfolio with a side helping of insightful, intelligent commentary on projects by other artists and firms. 30. Ecolet:A variety of papers and other specific supplies are all necessary for a successful graphic design career, and Ecolet features products and artists all striving towards environmental sustainability. It looks into how design and advertising work can be applied to work towards promoting a healthier planet. 31. Design Inspiration:Illustrator and designer Jeff Andrews has dedicated the past four years of Design Inspiration to interviewing and featuring the art of his contemporaries. It grants some well-earned exposure to many hard-working and exceptionally talented individuals. 32. Gallery of the Absurd: This deservedly popular blog does such an excellent and provocative job skewering the inexplicable celebrity worship aspect of society and roasting it over ragingly hot coals that many forget the extremely masterful artwork that goes along with it. 33. Green Printer Blog: Due to their association with printing, many graphic designers are concerned with ways their profession can adhere more to green principles. This blog promotes environmental sustainability by focusing on economical and effortless ways to consider the planet without compromising professional needs. 34. ISO50:With an emphasis on music and fashion as much as design, this collaborative effort brings trendy art, clothing, and sound to the forefront of readers’ awareness. 35. CRIT:Graduate students at the School of Visual Arts in New York discuss their projects as well as offering critique of other artists as a means of applying lessons to real-life situations. Their ultimate goal involves engaging other professionals and students worldwide in intelligent discussions of graphic design. 36. Graphic Design Bar:This blog’s aim is admirable in its simplicity – all it hopes to accomplish is to offer news and articles it finds around the web and share it with fellow graphic designers. And it does a fine job providing exposure to interesting and visually striking pieces. 37. Exhibit Files:For those working in the museum and gallery industry, this blog compiles information and discussions of personal experiences on hundreds of exhibits on hundreds of topics. Though run by the Association of Science-Technology Centers, many of the shows involve the application of art and design for the advancement of science. It is an oft-overlooked aspect of design work that deserves far more attention than it generally receives. 38. John Nack on Adobe:A graphic artist without Photoshop and Illustrator is rarer than a Tasmanian tiger sighting. Principal Product Manager for Adobe John Nack digs deeply into his product and offers tips and tricks on its nuances and applications. 39. The Story of Stuff :Another environmentalism blog offering discussions on how graphic designers can alter their businesses practices in easy, safe, and affordable ways that help keep the planet just a little bit healthier. 40. Outlaw Design Blog: Podcasts, freebies, and videos accompany this blog run by freelance creative consultant Danny Outlaw. Tutorials, product reviews, industry advice, and tips on how to market artistic talent for extra money comprise the majority of the content. 41. The Nonist:Though the author has since moved on to other projects, the articles remain some of the most intelligent and interesting reflections on art available. Writings delve into very obscure artistic places, shining a light on beauty that may otherwise go entirely overlooked or – at worst – unseen. 42. Logolog:A simple premise with a simple execution and loads of payoff, the Logolog shows off logos of interest along with a small explanation of why they work. 43. A Collage a Day:Another blog with daily updates on the artist’s output, this one features a new collage for sale every day. Colorful, gorgeous, and featuring intriguing juxtapositions of elements, these collages serve as yet another reminder that not all graphic design is created with a computer. 44. Sushi & Robots:The reflective art and design of Jina Bolton sits next to her highly accessible and thoroughly entertaining interviews, thoughts, inspirations, and favorite creative finds. 45. Art+Story:Chock full of character designs and other illustrations, this blog by a Los Angeles author and artist reflects on technology, the creative process, and how a project comes together over time. 46. Sugar Frosted Goodness! :A collective brimming with creativity and talent, the artists share their eclectic illustrations for both critique as well as sharing their passion for various media. It makes for a wonderful celebration of the myriad limitless forms that design can take. 47. The Logo Factory:The Logo Factory churns out branding and identity for a very wide client base, and their blog offers news from the industry and the occasional bit of advice for those seeking a career in graphic design or illustration. 48. Character Design :Character designers from the animation, comic, movie, and illustration industries weigh in on the similarities and differences of their careers with galleries, interviews, and commentary on practices, shifts, and trends. It is an amazing resource not only for other professionals, but students considering entrance into one of the aforementioned industries as well. 49. Snook:Web development and design is the main focus here, with everything from fonts, coding, and licensing issues to relevant book and product reviews available. Webmaster Jonathan Snook pokes, prods, and explores the technical and creative aspects of website design with readers along for the ride. 50. SeptemberIndustry:An intelligent online journal on all aspects of design – including architecture – tracking the projects and ideas of the best artists working in related industries today. Graphic design spans more than just digital art and illustration. It is a richly textured and highly nuanced form of visual communication that encompasses technologies both ancient and contemporary. These blogs celebrate the many facets of this wonderful and creative outlet, challenging perceptions and offering insight as to how concepts and innovation come together to result in amazing works of art. Designing a blog is easy. Whatever engine you are using and whatever style you prefer, you’ll always find a number of templates you can apply to your weblog in seconds. No styling is necessary, no playing with colors is needed and no mind jogging about content presentation is required. However, not every weblog should look like a typical blog. After all, not every blogger wants his or her site to look exactly like hundreds of other ones. In fact, there is a small bunch of creative, outstanding and individually designed from scratch blogs. In this post we didn’t try to showcase some eye-candy (although sometimes eye-candy is indeed offered); the designs listed below were selected for their attention to small details. Pretty and colourful header-graphics doesn’t make a good blog. The blog needs a solid visual structure, a profound hierarchy of site elements; it also has to be able to build some kind of a bridge between the content and its presentation. To do this, you need to think about precision, minimalism and sound use of illustration. These criteria were the ones we’ve used to select the designs listed below. All these aspects make the designs we’ve selected look… well, not always beautiful, but outstanding, almost excellent in their own kind. Mostly it’s the idea the designers used to make the weblog as usable as possible – not the implementation of this idea – which we’ve been after. Below you’ll find 45 excellent blog designs which impress with creative approaches and attention to details; hopefully you’ll find new ideas you can develop further in your own designs. Notice that the screenshots we’ve provided may give you a wrong impression about the whole design of the sites; in doubt you should take a closer look at headers, footers, comment-areas, site structure and further site elements. Please also notice that you can click on screenshots to get to the sites from which the screenshots have been taken. We’ve missed something? Definitely! Let us know in the comments! Whitespace in use. The categories and popular entries are listed at the top of the page, not in the sidebar as they usually are. An almost “classic”, well-known design, but still incredibly beautiful. Veerle makes use of a dark layout with quite colourful scheme. The result is impressive – and the position of site elements extremely well thought-out. A typical weblog doesn’t look like an illustrated magazine. Kevin Kornell’s blog does. This one makes use of an “oldie”-style. A minimalistic approach with clean web-typography. Fresh and clean design, lacking almost everything – there is even no navigation in blog categories. A Business-Design. Look at the information sections on the left side of the layout. Extensive use of visual elements prevails; it might be a nice idea, but the content should prevail. Playful design with dozens of swirls, curves and artistic elements. Playful flower-images and ornaments seem to be trends. Probably not the most gorgeous layout ever made, but well-structured. The use of colors communicates the idea of the site. Sometimes it is an interesting approach to use a “thin” layout, although it should rather be an exception. Stylish, readable and clean. The site doesn’t look like blog at all – at least at the first glance.